You better be good, because Santa Claus is coming to town and will be bringing you gear for the upcoming spring turkey season! Each year passionate turkey hunters make out their Christmas wish list with hopes that their loved one will answer their plea for gear that can help them the following spring. We are all guilty of getting things we need the evening before opening day, partly because we forget to ask for the essential gear during the season of giving. To assist you in your Christmas shopping, Wild Turkey Report has listed a few products we recommend you put in your list to Santa. While the crew at Drake Waterfowl may be known for their brilliant waterfowl hunting gear, they have stumbled upon the crème de la crème of turkey hunting boots with their EST Knee High Mudder boots. Built in a similar mold to other lightweight rubber boots on the market, what separates the EST is that the calf and shin portion of the boot is more lightweight than other options. Additionally, Drake’s patented D2D Comfortrac System™ and “athletic traction sole” provide a snug fit and less slipping and sliding in muddy conditions. To boot (pun intended), the EST Knee High Mudder is available in Mossy Oak Bottomland, a pattern that just oozes turkey hunting tradition. Be careful though, Santa may try to steal your pair before he puts them under the tree. 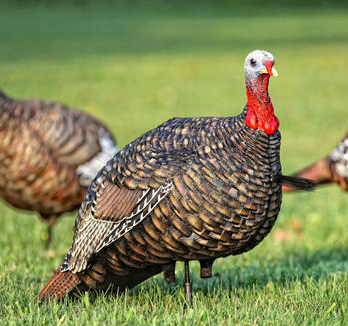 Few decoys have taken the world by storm (and fooled innocent by-standers) like the Zink Calls’ Avian X line. The LCD Jake Quarter Strut was introduced in early 2012 and led to the demise of countless boss gobblers this past spring, thanks in part to its ultra-realistic design and detailing and non-aggressive pose, which has proven to work on dominant and sub-dominant gobblers. All Avian X turkey decoys are crafted from rugged Dura-Rubber, but can easily collapse and be stored in your turkey vest. If you are looking to fool that evil turkey that gave you the slip last spring, ask Santa for an Avian X LCD Jake Quarter Strut decoy. There’s just simply something about owning a quality friction call, and my personal pride and joy is the World Class Slate from Cody Turkey Calls. Few companies place the emphasis on quality that Cody does, and it shows in the sounds their calls produce. The World Class slate is crafted out of the highest quality walnut and Pennsylvania slate, and hand crafted in Cody’s 5000 square foot facility in Pennsylvania. Matched with a heavy hickory striker, this call is trouble for love sick longbeards, and belongs under a tree on December 25 and in your vest this spring.